Create wriggling lines, bars, points, and shapes that move to the beat of the music without ever having to set a keyframe in Final Cut Pro X. With the FCPX: Audio Visualizer, making video DJ backgrounds has never been so easy. 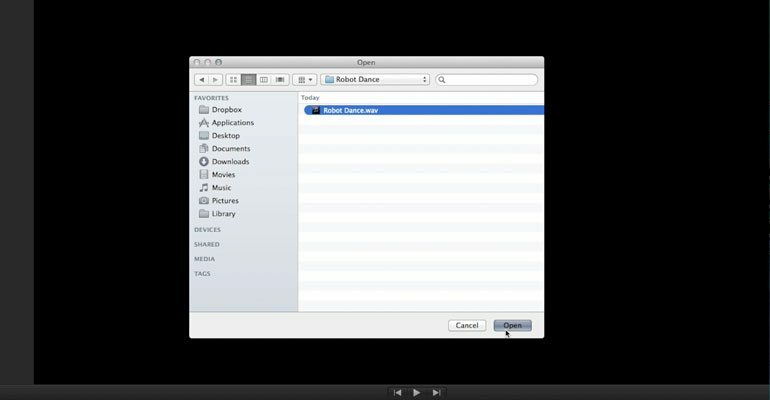 Users simply have choose a song file, and customize the look. The FCPX: Audio Visualizer requires the latest versions both Final Cut Pro X and Mac OS. 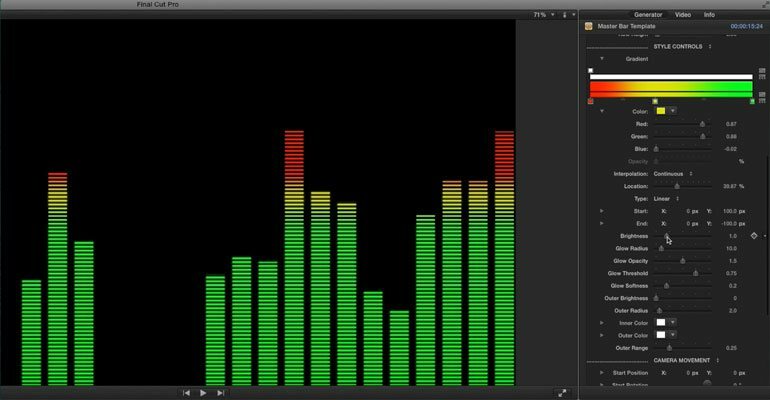 Based on popular music videos and dj backgrounds, The Audio Visualizer was designed to help users create moving lines and shapes that will perfectly match the beat of their song. 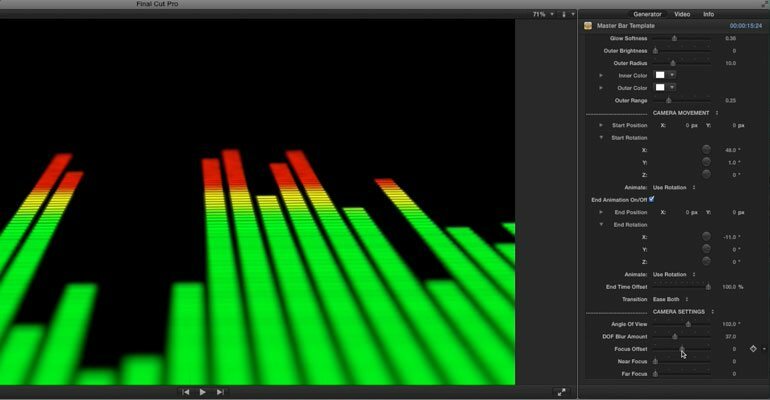 FCPX editors can simply choose a wav audio file and the FCPX Audio Visualizer will automatically detect the BPM and loudness of the track. From bouncing bars to wriggling lines to jumping dots, users can visualize their audio in endless unique ways. Editors can simply drag the style they want into the timeline and import their audio into it. The FCPX: Audio Visualizer will then create a customizable waveform based on the song. Once users have the generator and audio in the timeline, they can go to the FCPX Inspector window to customize the visualizer. Editors have total control over the color, size, distortion style and much much more. The FCPX: Audio Visualizer was professionally designed to work inside Final Cut Pro X. Users simply have to choose song, and use the FCPX Inspector window to calibrate the look. Don’t go easy with this effect! Drop it as hard as your beat! 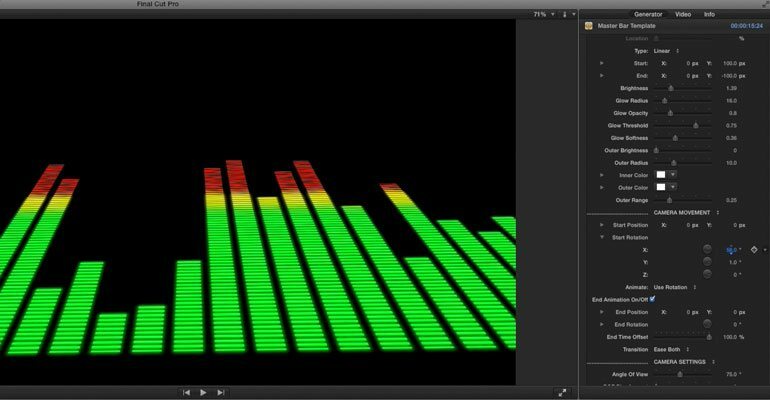 Learn how to add and customize your very own professional audio visualizer in Final Cut Pro X with the FCPX: Audio Visualizer Lesson. Let’s begin by going to the FCPX generators library to locate the Audio Visualizer presets. For this example, we will use the Master Bar Template. Then select an audio file and place it below your media in the timeline. Click and drag the edge of the generator to make it the same length as the audio file. Now, it’s time to import our audio and set it up in the generator. Select the generator and go to the Inspector window. Press the Choose Song button. This will bring up a finder window. Find and select the same audio wave file that you already placed in the timeline. Next, use the Frames per second drop down menu to match the frame rate of your project. If you want each tone frequency to get its own bar, you can check the full spectrum checkbox. If don’t check this box, many of the frequencies will be averaged and condensed down into about 30 bars. If you don’t want the bars to fall so quickly, you can turn up the smooth audio slider. This will make the bars fall slower after they have reached their peak height. If you want the audio to feed off a part of the track that comes later on, you can use the Music Offset slider. 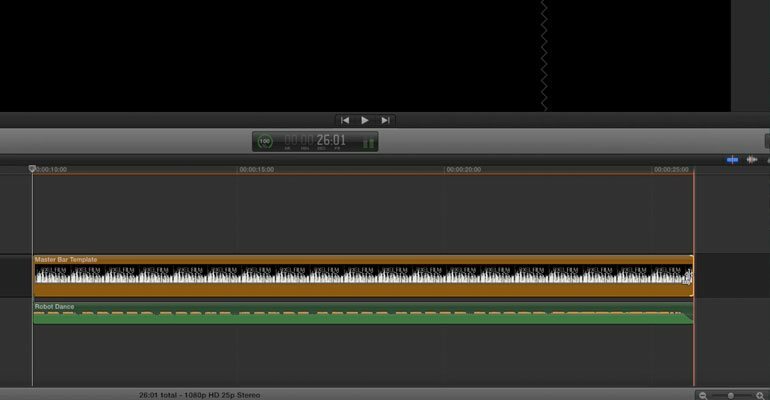 Move the slider to the frame number of where you want the audio to begin. Remember to take the frame rate of your project into account. For instance, if you want the Effector to begin feeding off the audio file from the 10 second mark in a 24 frames per second project, you would move the slider to 240. Now that we have our audio setup inside the generator, we can customize the size and position of our bars. Go to the Bar Controls section of the Inspector window. The Bar Position parameters can be used to move the location of the entire visualizer. While the Bar X Offset slider can be used to shift the visualizer left or right. 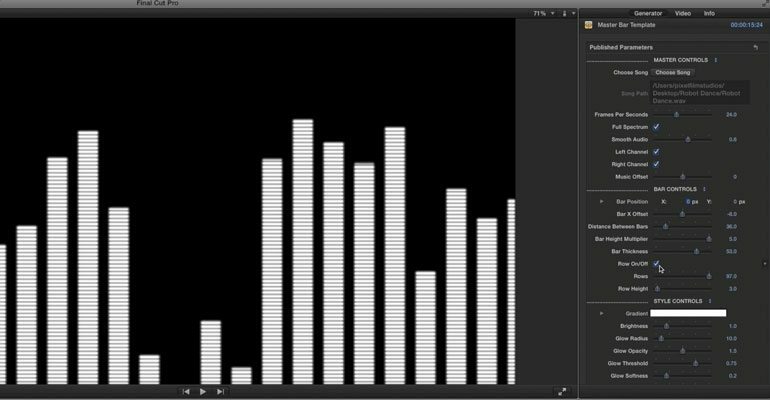 The Distance Between Bars slider can be used to adjust how large you want the gaps between each bar. You can then use the Bar Height Multiplier to make the bars taller or shorter. The Bar Thickness slider can be used to make the bars thicker or thinner. If you want the bars to be broken up into rows you can check the Row On/Off checkbox. You can then use the Rows and Rows Height sliders customize the look. If you need the row number to exceed the amount that the slider allows, you can click and drag the number to the right of the slider up to any value you need. Now that we have the Bars setup, let’s stylize them. Go to the Style Controls section of the Inspector window. Use the gradient bar to adjust the color of the bars. Click on each of the boxes attached to the gradient bar to set the colors. If you would like the gradient to include more than the default amount, you can click on the bar to add more boxes. Next, you can use the brightness glow and outer glow parameters to further customize the look of your visualizer. Now that we have our Visualizer looking the way we want it, it’s time to adjust the camera controls. Move the playhead in the timeline to the front of your generator. Then go to the Start Position and Rotation control sections of the FCPX Inspector, and change the parameters to where you want the camera to begin. When you are done setting up the start orientation, move the playhead to the end of the generator and repeat this process with the end parameters. Scrub the timeline to preview the movement. Now for some Final Touches. Go to the Camera Settings section of the Inspector window. Use the Angle of View slider to give your visualizer a wide or narrow lens look. Use the DOF Blur Amount slider to control the strength of the depth of field. Then use the focus offset, along with the near and far focus sliders to control which area you want to remain in focus. Which audio files are compatible with FCPX Audio Visualizer? 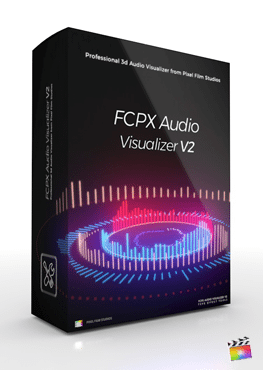 FCPX Audio Visualizer is compatible with .mp3, .wav, .aac, .aif, .aiff, .aifc, .snd and .au audio files. What happened to the frame rate control? FCPX Audio Visualizer no longer includes the frame rate slider due to a recent update that now allows the plugin to automatically detect the optimum frame rate. Why does only part of my Visualizer show during playback? FCPX Audio Visualizer will need to be used in a 1920 x 1080p project in order for the entire Visualizer to appear. If it is used in any other resolution it will distort the effect.